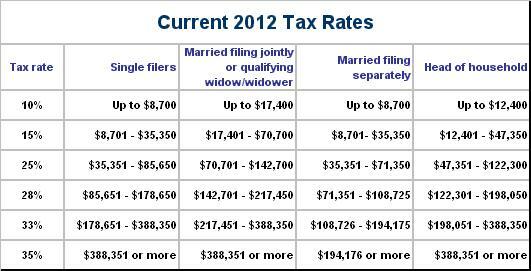 The current 2012 Tax Rate Schedule is shown below. Applying the Obama-Doctrine, single filers making over $200,000, and married filers making over $250,000 would get a tax hike. However, since there is no cut-off at either $200,000 or $250,000 in the current tax rate schedule, the 33% bracket would need to be split, resulting in a sharp tax increase for a handful of unfortunate individuals. Thus, taxpayers with taxable incomes between $200,000 ($250,000 if married) and $388,350 would see their taxes rise by 20%, while those with incomes over $388,350 would get that plus a marginal increase of 13.1% on income above the new ceiling (see tables below). We’ll use the married filing joint filing status in the following examples to determine the overall effect. # 1 – If you’re married and have taxable income of $400,000, your taxes will increase by 19.4%, or by $9,667. # 2 – If you’re married and have taxable income of $1,000,000, your taxes will increase by 14.3%, or by $37,267. # 3 – If you’re married and have taxable income of $10,000,000, your taxes will increase by 13.2%, or by $451,267. # 4 – If you’re married and have taxable income of $20,000,000, your taxes will increase by 13.2%, or by $911,267. # 5 – If you’re married and have taxable income of $100,000,000, your taxes will increase by 13.2%, or by $4,591,267. First of all, those with taxable incomes below $200,000 ($250,000 if married) get to keep the tax rates they’ve had for the last 10 years, plus all the other garbage in the tax code, which is being called –– a tax cut. So in other words, for 95% of Americans, nothing is the new something. Secondly, those who already pay the highest tax rates will receive a 13.2% to 20.0% tax hike, which is being called –– fair. However, tax rates will go up the most not on millionaires and billionaires, but rather on single individuals with taxable incomes between $200,000 and $388,350 and married couples with taxable incomes between $250,000 and $388,350. So why not just admit it? This isn’t a tax cut for the middle-class. And it’s not so much a tax hike on millionaires and billionaires. What it represents is a massive tax hike on those with taxable incomes between $200,000 ($250,000 if married) and $388,350, and a more modest hike on millionaires and billionaires. Got it? If a top marginal rate of 33% has been proven to raise more revenue than higher rates, due to the Laffer Curve (see video: Do High Taxes Raise More Money? ), then why are we even talking about raising rates above the 35% mark? Aren’t rates already too high? Couldn’t we achieve the same parity by keeping top rates where they are and simply cutting tax rates on the 95% of Americans with incomes below the new ceiling? Why, yes we could. And here’s what the new tax rate schedule would look like if we were to do just that. The 10%, 15%, 25%, 28% and 33% brackets are reduced by 13.2% (the same amount of increase currently being proposed on the wealthy), and are thus lowered to 8.7%, 13.0%, 21.7%, 24.3% and 28.6%. 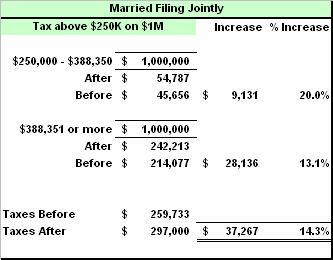 Note that the 35% bracket is still lowered to include those with taxable incomes over $200,000 ($250,000 if married), so that those making between $200,000 ($250,000 if married) and $388,350 will still see a modest increase of around 6%, but isn’t this the group we we’re trying to screw anyway? Yep! So there you go. You say, “But what will your plan do for the deficit”? I say, what does the one on the table do for the deficit? Score them both dynamically (skip the static nonsense) and see which plan raises more revenue in the long-term. Not that it really matters though, since the main goal here is fairness, right? Well, that’s what my plan achieves. So here’s how the Obama-Doctrine stacks up against the reverse parity plan. 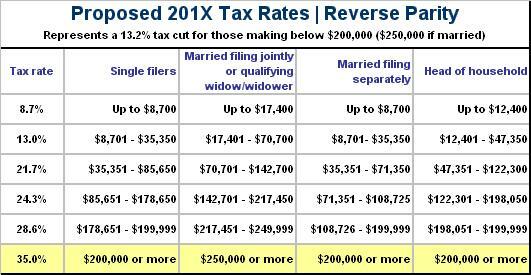 At current tax rates, married taxpayers filing jointly pay the following taxes (see table below). Under the Obama Doctrine, married taxpayers filing jointly get nothing at taxable incomes below $250,000, and realize a 13.1% (rounded down) tax increase at upper levels. This means income tax burdens would increase by $451,267 to $4,591,267 for those with taxable incomes between $10,000,000 and $100,000,000, respectively (see table below). 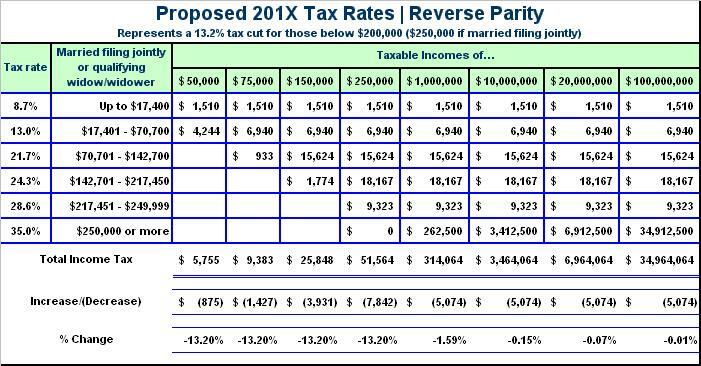 But under the Reverse Parity Plan, married taxpayers filing jointly will realize a 13.2% tax cut at taxable incomes below $250,000, and only negligible savings at upper levels. This means income tax burdens will decrease by $875 to $7,842 for married couples with taxable incomes between $50,000 and $250,000, respectively (see table below). At the same time, income tax burdens will fall by $5,074 for those with taxable incomes over $1,000,000, representing a negligible decline. It’s the same thing the White House is striving for, except in reverse. The big difference is that under the reverse parity plan the middle-class gets a genuine tax cut, not just smoke and mirrors, while the upper-class pays an effectively higher tax rate, roughly 13.1% more than those with taxable incomes under $200,000 ($250,000 if married), and this is achieved without actually raising tax rates. The only exception, of course, is those poor saps stuck between taxable incomes of $200,000 ($250,000 if married) and $388,350, but that’s life, right? It’s real simple. If ‘no change’ for 95% of Americans can be deemed a tax cut, then ‘no change’ for the remaining 5% can likewise be deemed a tax hike. It’s magic! Ninety five percent of taxpayers receive a stimulative tax cut, the top five percent get nothing, the Laffer Curve is respected, and fairness is restored. Problem solved. Now it’s time to tackle the real problem, those elusive spending cuts.